I’m a huge fan of items that can’t only be paired with different things, but also be incorporated into different styles of outfits as well. I might continue doing these types of posts, focusing on different staple pieces. The focus piece for this post is this chambray circle skirt from styligion.com. The more I look at it, the more I feel like it is a piece I really want in my wardrobe. If you’re going on a city holiday this summer, somethig like this is perfect to wear togo sightseeing, given that it’s quite hot out. Crop tops are gorgeous with high waisted skirts, which is great for us that aren’t quite comfortable enough to wear them with low rise items. 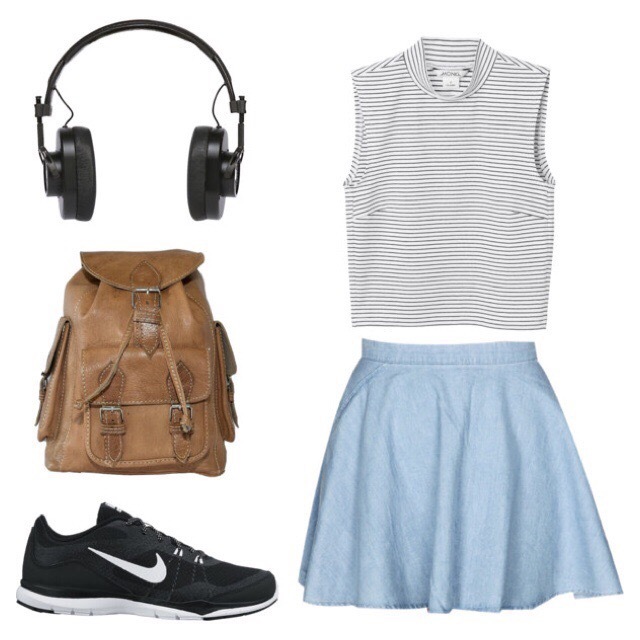 The trainers and the backpack are currently both comfortable and stylish, which is the best of both worlds! This outfit would be good for something like a beach party because of the lightness of both the skirt and the top. It’s breezy, but still a bit dressed up. Especially with the added wedges and the curly hair. The oversized beach bag gives a pop of colour and adds a more casual vibe to the outfit. Outfit 3: Most formal More appropriate for the night, but still keeping the summery vibe. The white shoe and top combination, combined with the light skirt and makeup makes for the perfect summe party look. The dainty necklace would look great on top of the realitively high neck top as well.